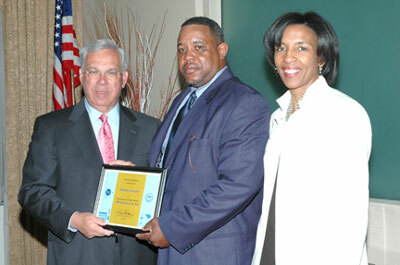 Mayor Thomas M. Menino today presented awards to Dorchester volunteers and businesses at the Boston Main Streets (BMS) 10th Anniversary Awards Ceremony, which took place at the offices of Bank of America. Awards were presented to 2005 Boston Main Streets Volunteers of the Year, Businesses of the Year, and Friends of Boston Main Streets. "This event is special because it honors the people in the neighborhoods who are making our local commercial districts vibrant and welcoming places to shop and do business,” Mayor Menino said. “These are the people who do the behind-the-scenes work without expecting any credit or pats on the back. Their only reward is to get the job done. Tonight we honor some of these people. Tomorrow they will be back on the job." In 2005, hundreds of Main Street volunteers gave 20,492 hours of time while fostering 31 net new businesses, completing 53 new storefront projects and delivering design assistance to 54 shops for 2006 improvements. Main Streets districts have documented more than 3,643 net new jobs since the inception of Boston Main Streets in 1995. 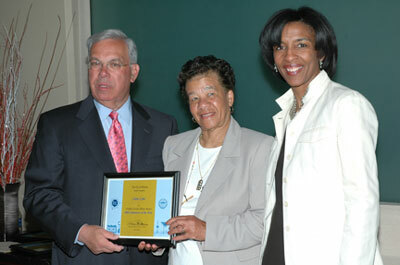 Mila Monteiro accepts the Bowdoin Geneva Main Streets Volunteer of the Year Award from Thomas M. Menino and Charlotte Golar Richie, Chief and Director of the Department of Neighborhood Development. 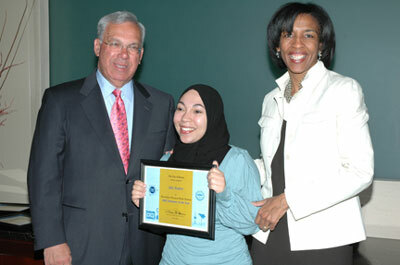 Mayor Menino recognized Mila Monteiro as the Bowdoin Geneva Main Streets Volunteer of the Year. She has played a significant role in the revitalization and reshaping of BGMS. She has contributed to its collective success by assisting in the membership drive and by showing residents and businesses the benefits they can receive by having a voice in their neighborhood. 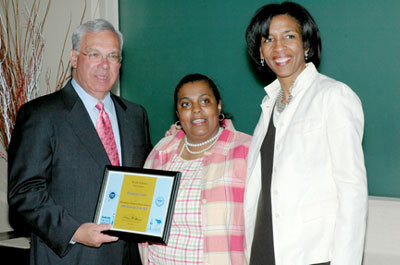 Mayor Menino presents the Bowdoin Geneva Main Streets Business of the Year Award to Restaurante Cesaria owner Lisa Barros. Restaurante Cesaria was recognized as the BGMS Business of the Year. Cesaria, owned by Lisa Barros, is a family-oriented business that serves the best African and Portuguese Cuisine around. They extend usage of their premises to Bowdoin Geneva Main Streets whenever needed, sometimes free of charge or at a lesser fee. They also provide monetary donations as well as help out whenever necessary. They are one of the leading businesses in the community and care about what is going on around them. The 2005 Fields Corner Main Streets Volunteer of the Year is Arlene Lopes. She has worked tirelessly on behalf of FCMS in many capacities: meeting with business owners about the Storefront Improvement Program; walking the district talking to businesses about whatever meeting, promotion or activity FCMS is undertaking; working to spearhead an anti-litter campaign through the STEPS grant; and working to mobilize people to start an elder friendly business district initiative here. 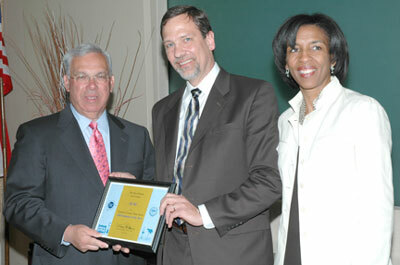 Dorchester House was honored as 2005 Fields Corner Main Streets Business of the Year. The 2005 Fields Corner Main Streets Business of the Year is Dorchester House Multi-Service Center, a full-service, state-of-the-art community health center offering primary and specialty medical services to people of all ages. Dorchester House has been extremely supportive of FCMS. They were a Platinum Sponsor ($1,000 -- the highest sponsorship level) of our first fundraiser since the board was reorganized, “Martinis on the Avenue.” They donate our office space, all utilities including network and Internet access, and photocopier and fax usage. Finally, they have been very supportive of employee and FCMS President Ira Schlosser’s time spent on FCMS business. 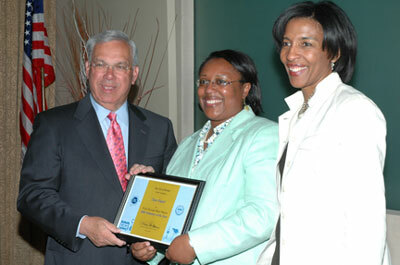 2005 Four Corners Main Streets Volunteer of the Year Diane Wignall accepts her award from Mayor Thomas M. Menino. The 2005 Four Corners Main Streets Volunteer of the Year is Diane Wignall. Ms. Wignall has been a volunteer with Four Corners Main Street from its inception in 2000. After a brief hiatus, she has been back in full force for the past three years, active on our Design Committee and a Board member since the fall of 2004. As an artist, Wignall has contributed significantly to the redevelopment of our local park and creation of a decorative park gateway. Currently she is working to engage residents in designing an additional artistic feature for the park. She is always brainstorming ways to connect Four Corners to the arts and using creative industries to build up our commercial district. Woodland Construction merited the 2005 Four Corners Main Streets Business of the Year. The 2005 Four Corners Main Streets Business of the Year is Woodland Construction, a small construction company with 28 employees. Attracted to 200 Washington Street for its architectural features, owner Trevor Blake set out to enhance a signature building in Four Corners. Purchased in May 2005 from a church, Blake has invested hundreds of thousands of dollars into this project. Two storefronts were created on the first floor and the basement has been renovated to house his company, Woodland Construction. Six two-bedroom apartments on the second through fourth floors have new kitchens, bathrooms, and refinished wood floors. This spring the vinyl siding will be removed from the building and replaced with Hardiplank fiber cement siding, which will significantly improve the exterior of the building. 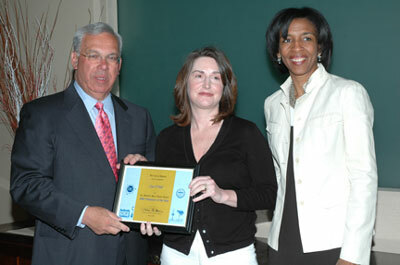 Lisa O’Neill accepts the 2005 St. Mark’s Area Main Street Volunteer of the Year from Mayor Menino and Charlotte Golar Richie. The 2005 St. Mark’s Area Main Street Volunteer of the Year is Lisa O’Neill. Ms. O’Neill joined St. Mark’s Area Main Street’s Board of Directors in December 2004 and immediately began working to improve SMAMS’s financial situation. In the spring of 2005, SMAMS was facing the loss of its original corporate buddy. O’Neill, a loan officer for Countrywide Home Loans, recruited Countrywide as a new Corporate Buddy and contributed money from her own marketing account for that purpose. She also volunteered to serve as SMAMS Treasurer and to form and lead a fundraising committee. She recruited friends and co-workers, and in less than a year the committee has held two raffles, a grand opening celebration for the Ashmont Grill restaurant, a martini party co-sponsored with Fields Corner Main Street, a mid-winter luau, and a comedy night. These events have helped SMAMS financially, and they have also won many new friends and supporters. O’Neill has brought new energy, leadership and volunteers to SMAMS’ fundraising efforts and has put the “fun” in fundraising! St. Mark's Area Main Street 2005 Business of the Year is the Ashmont Grille. The 2005 St. Mark’s Area Main Street Business of the Year is the Ashmont Grill. The Ashmont Grille, founded in 1959, has been a neighborhood institution in Dorchester’s Peabody Square for many years. But in the last few years it had fallen on hard times. Chris Douglass, owner and head chef at the top-rated Icarus Restaurant in the South End, knew first-hand from talking with SMAMS that residents wanted a first-class restaurant in the neighborhood. In 2005 Chris took a leap of faith and bought the Grille and the building. With financial help from SMAMS and the Department of Neighborhood Development, he gutted the building and rebuilt it from the framework out. He brought in a new menu, a chef from Icarus, and a staff that is both knowledgeable and friendly. Valentine “Val” Pajer is the 2005 Upham’s Corner Main Streets Volunteer of the Year. 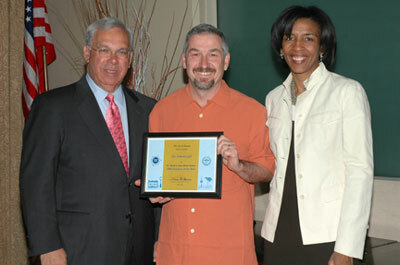 The 2005 Upham’s Corner Main Streets Volunteer of the Year is Valentine “Val” Pajer. Mr. Pajer has represented Staples, the Upham’s Corner Main Streets Corporate Buddy, on the board for the past two years. His commitment to this main street organization far surpasses the corporate buddy relationship. In addition to being on the board, he is vice president of the ER committee. He has led the ER committee in developing an important new program benefiting merchants in the district – a Business Networking Luncheon program bringing information on services, financing, marketing, etc., to merchants and area businesses each month. He is a strong supporter of UCMS’s annual fundraiser, Jazz Night Out. Staples support through Pajer extends beyond Upham’s Corner and touches the entire Boston Main Streets program. 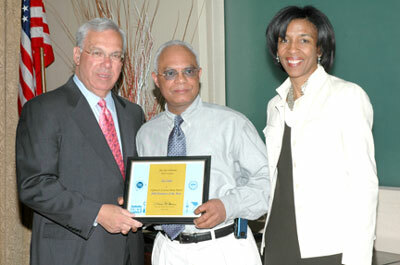 Mayor Menino honors Ka-Carlos, the 2005 Upham’s Corner Main Streets Business of the Year. The 2005 Upham’s Corner Main Streets Business of the Year is Ka-Carlos, a terrific new destination restaurant. The restaurant and bar was renovated from a bar/lounge with UCMS legwork/guidance and City of Boston financial assistance. The new establishment is comfortable and visually appealing and it offers a wonderful menu of satisfying dishes. It is one of the best new business endeavors to happen in our district in quite some time, offering residents and visitors alike yet another reason to spend quality time in the Upham’s Corner business district. 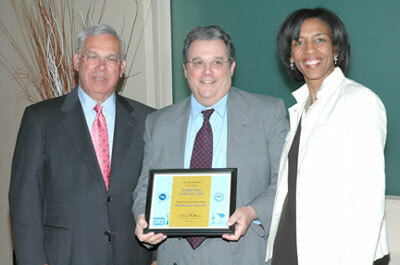 The 2005 Friends of Boston Main Streets Awards of Appreciation were presented to Wallace Olsen of ASCIO Wireless, Alec Stern of Constant Contact, Lori Cox of Boston Public Schools Countdown to Kindergarten, Denise Snyder of Boston Public Schools Countdown to Kindergarten, and Lisa Di Nanno of 93.7 Mike FM Radio.